Travelers go crazy for archaeological sites. The Pyramids and Pharaonic temples of Egypt, Rome’s Colosseum, Chichen Itza in Mexico, and England’s Stonehenge — to name a few — are so incredibly popular that entire trips are planned around visiting them. But our interest in the vestiges of bygone civilizations is often limited to the sites that make it to our Instagram feed, leaving other incredible ancient ruins almost unknown and without visitors. Case in point: our herd-like traveling ways have led many of us to visit the ancient city of Petra in Jordan. We go en masse to check out the amazing monuments carved in the sandstone rocks, while Mada’in Saleh, a very similar site in Saudi Arabia less than a six-hour drive from Petra, remains almost empty. 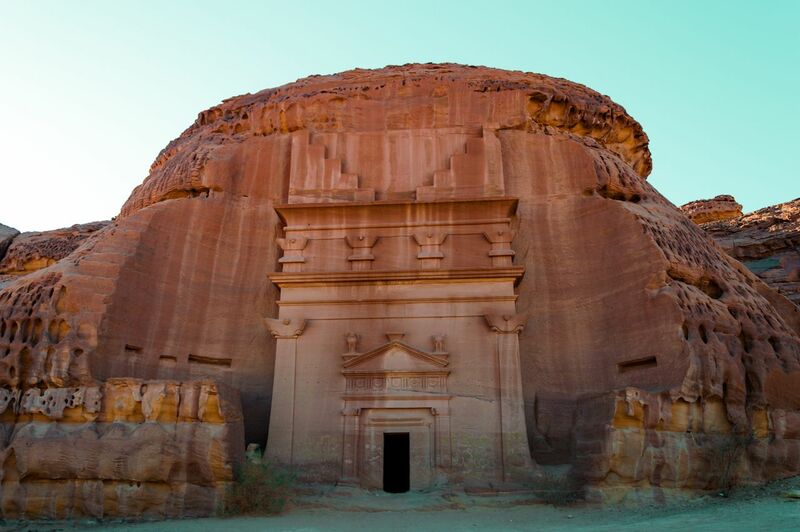 Mada’in Saleh is located in the northwest of the Kingdom of Saudi Arabia. Although the site is in the desert, you won’t need to trek for days to reach it. The nearest airport is a 40 minute-drive south of the archaeological site, in the town of Al ‘Ula. 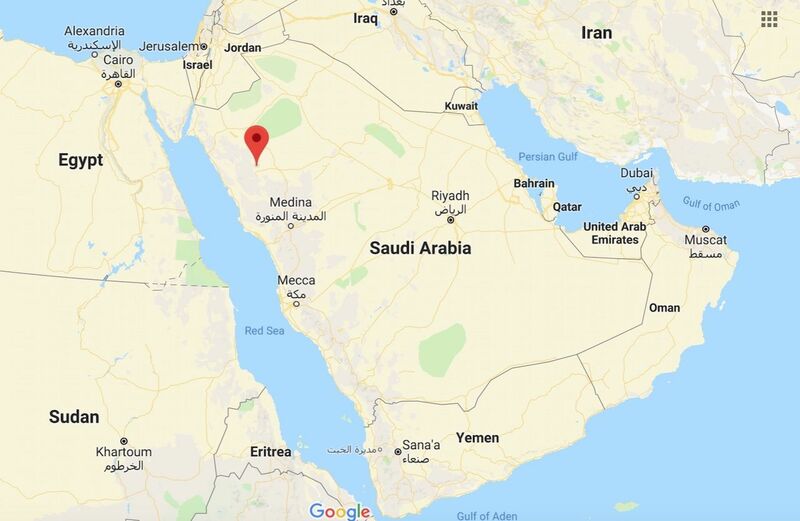 You can fly direct into Al ‘Ula from the capital city of Riyadh (the flight takes one hour and 40 minutes) or drive from Medina for less than four hours. Travelers who wish to visit Mada’in Saleh need to obtain permission first and hire a tour guide. According to The New York Times, all of this is easily and quickly done via your hotel reception and with a copy of your passport. Mada’in Saleh (called Al-Hijr in Arabic) dates from the first century BC to the first century AD. 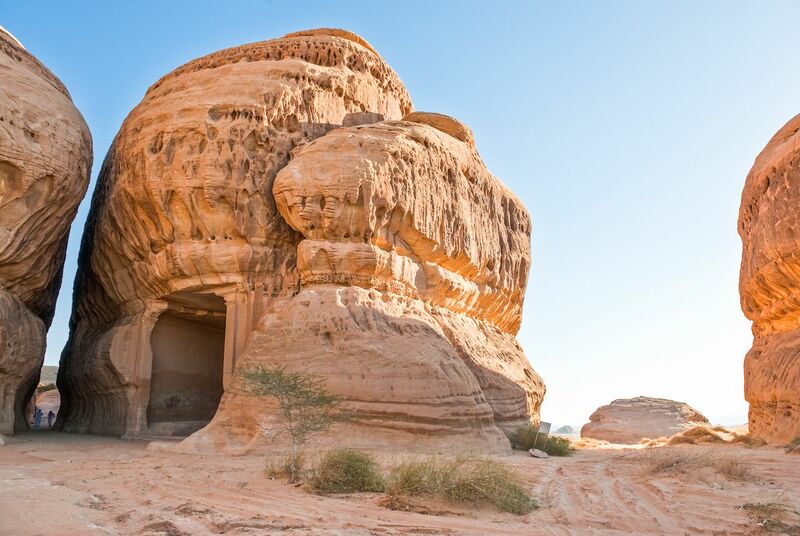 The 2,000-year-old site was built by Nabataeans, pre-Islamic Arab people from the northern part of the Arabian Peninsula famous for their skilled harness of water in the Arabian desert. Mada’in Saleh was the second-largest city during the Nabataean civilization — the largest being the capital city of Nabataea, Petra. Mada’in Saleh was located on the path of the international trade route that connected the Arabia, the Mediterranean world, and Asia. The Nabataean civilization collapsed around the fourth century BC when trade goods started being transported via Syria and the Red Sea rather than through the Nabataeans’ land where they imposed taxes on caravans. 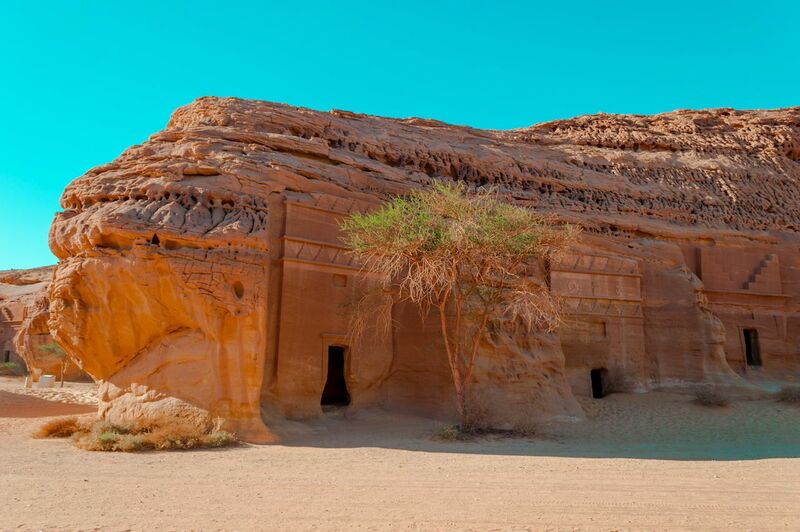 According to the Saudi Commission for Tourism & National Heritage, Mada’in Saleh is thought to have faded out in the mid-second century AD. The ruins of the site consist of water wells and huge rock-hewn monuments and tombs adorned with elaborately-decorated facades and inscriptions. 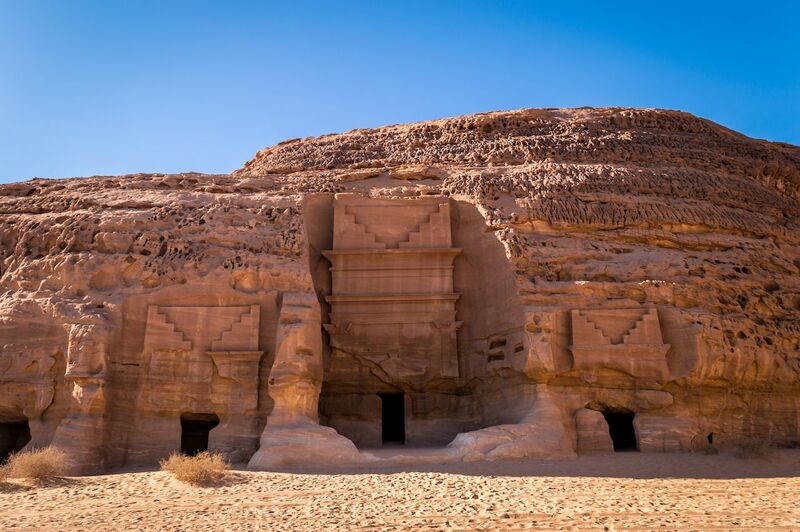 According to UNESCO, there are 111 monumental tombs remaining in Mada’in Saleh, 94 of which are decorated. Visitors to the site can enter and explore the tombs and won’t have to compete for space with anyone — the place is almost entirely devoid of tourists. Although these architectural vestiges are not as pristine and well taken care of as the ones found in Jordan, they are still extremely beautiful and well-preserved. According to the Saudi Commission for Tourism & National Heritage, Al Qasr Al Farid (pictured below) is the most famous tomb in the necropolis as it has been carved out of a single, large rock and stands alone in the desert landscape. Mada’in Saleh became Saudi Arabia’s first UNESCO Heritage Site in 2008, but the previous difficulties in obtaining a visa, and the country’s very conservative reputation and shoddy human rights records were deterrents to tourists. 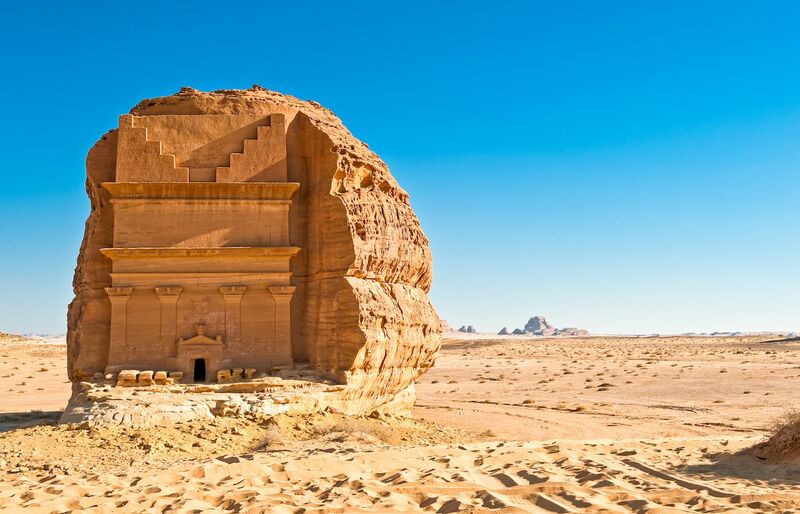 However, since Saudi Arabia has been recently opening up to outsiders, more travelers may be able and willing to check out this wonderful site that is on par with Petra on every level.